Allah, subhanahu wa ta’ala, the Creator and Originator of everything from the beginning of time until its end tells us that He sent sayyidina Muhammad, sallallahu ‘alayhi wa sallim, with Islam for man to live by. With Allah it is the only deen that is acceptable; that means it is the only road -Shari’ah- that leads to Him and the Garden in the Akhirah, the permanent destination. It is not a religion among religions; all religions are astray and do not lead to Allah or salvation. This includes ‘Islam’ if it turns into a religion as opposed to the way of Islam -submission- that all the prophets brought. Shari’ah relates completely to our being in this world and in these bodies. From birth to death we must eat, sleep, wash, buy, sell, give, take, raise families, take care of our parents, bury our dead, and so on. Every breath is a step towards the Next World, every moment brings new actions; Shari’ah enables us to do the right thing at the right time. The Deen of Islam is following the Shari’ah laid down in Allah’s book and in the example of the Prophet. It is the path of knowledge in action and action from knowledge. The word ‘Deen’ comes from the same Arabic root as the word ‘Dayn’, which gives us another point of view for our understanding. Dayn is a debt, something borrowed from another which has to be repaid. You could say that our lives have been lent to us, and will have to be returned and accounted for. If Allah wants good for someone He guides him to Islam, and tests him by this deen throughout his life. The Muslim who takes the Shari’ah to Allah in the Akhirah is always aware of Allah on the journey and whether Allah is pleased with him or not. If Allah loves him He does not leave him alone, or let him get away with anything, so that he will not have to endure suffering after death. The one who rejects Allah’s generosity and does what he wishes may be left to himself, thinking that he is all right and doing well in his darkness, and Allah may even reward him for any good he may have done, leaving him nothing to protect himself against Allah’s displeasure in the final encounter when the debt falls due. Islam is for everybody, and is therefore not complicated. The struggle is not in understanding but in implementation. It is to put into practice what you are commanded; it is to live by what you know by virtue of the teaching of the Rasulullah, sallallahu ‘alayhi wa sallim. Unlike the earlier manifestations of Islam brought by previous prophets, this last completed message is for all men until the end of time, whatever their language, race or position in society. If not now, when; if not here, where? If not you, who? There are people all around you who do not know about Allah, among them are those who will carry the banner of Islam in the future and among them are their enemies. When you give them the good news of the Deen and warn them of the dangers of continuing to ignore Allah, then you will see them for who they are and you will have done your duty and find Allah closer to you than before. The word Madinah also comes from the same Arabic root structure. It was a city with another name until the Rasul came to it. All that was Yathrib was submerged by the reality of the birth of Islam within its precincts. It became the city where the people took on the Deen of Allah in obedience to the Rasul and submitted to Allah in favour of anything or anyone else. It is the place where the deen was established by Sayyidina Muhammad,sallallahu ‘alayhi wa sallim, and his companions and from where they and their followers and their followers took it to the world. It is the blueprint for society until the end of time. Madinah is the place of the Deen of Islam; justice and pure Aqidah only return to us when Muslims return to its reality and example. Be like the Rasulullah and do not argue, say only that you have submitted to the will of Allah, because the Kuffar only dispute to destroy you and establish their world view; those with good hearts will not come to Allah by argument, but by the recognition of the light of Iman that emanates from within the hearts of the Muslims whose faces are turned towards Allah, subhanahu wa ta’ala. Why did He, subhanahu wa ta’ala, give us our existence only to take it back again? Why did He lend us His qualities of knowledge, strength, will, sight, speech, and hearing? It is not a secret. He tells us that we were created as His slaves. And I do not require them to nourish Me. Our job is to serve Allah; it is our reason for being and that is all. Our Rasul, sallallahu ‘alayhi wa sallim, shows us how. Allah offered him the choice of being a king/prophet like sayyidina Sulayman, ‘alayhi sallim, or a slave/prophet. He chose slavery; one day full, one day hungry, which means he did not concern himself with his provision but left it up to his Master. This is the nature of slavery; you do what your master wants and he looks after your needs. Today men and women are obsessed with the pursuit of their needs and desires. How is Allah going to view people whom He created for one thing, when they are engaged in another which He, subhanahu wa ta’ala, tells us He has taken care of? Your jobs do not feed your families; they are a means of enslaving you to other masters. Do what you want; know it is Allah who is the Lord and Master of all of creation and He is the One you answer to. Do you think He does not know of your affairs? Your reliance on others is what hides His and His Rasul’s compassionate concern for you. Do not live by the rules of the Kuffar; that way leads to destruction. Find the living people of Allah and ask them to guide you. The Deen is alive and well; are you sure you have it or are you just following cultural habits? You have to know! Who is your authority? Who is your leader? Now, in this world. There is no Islam without Sultaniyya, Amirate, Khilafah, leadership. Who do you obey without question? If you cannot answer that, you are in trouble because it means you follow yourself and we know that the Rasulullah,sallallahu ‘alayhi wa sallim, tells us that the solitary self is our worst enemy and a companion of Shaytan, the accursed. This is the Deen of the Kuffar; they follow their own whims and fancies, floundering around in their darkness. They are the people who command to the right and forbid the bad. The Deen of Islam is the only matter that will change our lives for the better. Democracy is Kufr. United Nations and human rights are Kufr. This oppressive, disgusting society is finished. Islam is returning, like the spring; full of new life that will bring back the society that was clearly outlined in Madinah by Rasulullah, sallallahu ‘alayhi wa sallim, his companions, may Allah be pleased with each and every one of them, and those that followed their excellent example. Muslims! Rely on Allah and ask Him to help your brothers and sisters in Islam, and make your actions bring benefit to those around you. Ya Allah! Return to us Your complete Deen, the Deen that will overwhelm the Kuffar and bring many of them to Your path. The Deen that will bring back the rule of Islam, sincere Iman and the attainment of Ihsan. Allah grant peace and blessings on Your Rasul, bless his family and companions all of them, particularly the four rightly-guided khulafa, Abu Bakr, ‘Umar, ‘Uthman and Ali, may Allah be pleased with all of them. 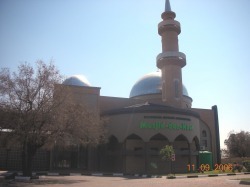 Allah bless the Muslims of the Botswana and their Amir with a blessing that will bring those around them to Islam and put them in the forefront of re-establishing the Deen and taking it to the people of the whole continent.